Military inspiration from the classic 1958 MA-1 “Bomber” jacket. An iconic aviation reference: The MA-1 flight jacket. Bell & Ross looks beyond cockpit instrumentation with its latest top-flight timepiece, inspired by the US Air Force’s groundbreaking icon of pilot apparel, the MA-1 flight jacket. Since 2005, Bell & Ross has bolstered its reputation for high- altitude performance by crafting its Instruments collection in keeping with cockpit read-outs: square, utilitarian, rugged. There is more equipment sitting inside a cockpit than just in- struments. The pilot’s flight jacket, for instance – an essential piece of gear that, with the emergence of the military’s Jet Age in the 1950s, experienced a step change over in America: the introduction of the MA-1. Originally a lifesaving tool, a fashion icon ever since, and in 2019 the latest inspiration to Bell & Ross’ quest for pioneering design. This year, meet the BR 03-92 MA-1: a streamlined take on Bell & Ross’ purest pilot watch, with subtly deployed details paying tribute to the US Air Force’s now-legendary MA-1 flight or ‘bomber’ jacket of 1958. 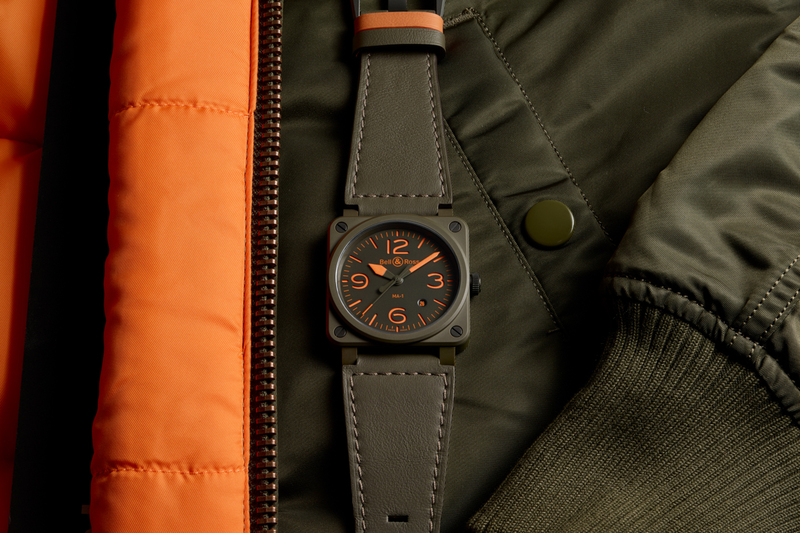 Encased in dark-khaki ceramic, with a sandwich dial stenciled to reveal the orange luminescent be- neath, plus reversible khaki/orange calfskin strap, this is a watch that – like the jacket – rewards the wearer with military know-how. The ceramic reaches this color when it is still at the oxide pow- der stage adding a pigment before the crystalline structure is made, creating this shade of dark khaki the at the earliest stage of development. The orange khaki color combination has always been synony- mous with the military. Dark green shades keep the wearer camouflage in the most extreme conditions whilst orange has deep roots in aviation. Still used today it highlights the most crucial and urgent commands within the cockpit of the plane, from where Bell & Ross originally took its inspiration for the Instrument watches.